French company, Neonumeric (what kind of an odd company name is that? 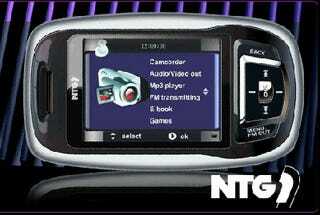 ), has been working on the NTG-1 portable media player. It has a boatload of features, but there is a big negative that will really hurt this device. It can play DivX, AVi, MPEG, WMV, MP3, WMA and WAV. It includes a 1.3-megapixel camera/camcorder/webcam, line-in, TV-out, FM tuner and a 2.5-inch TFT 260K LCD screen. The downside: no freaking built in memory. It includes a SD/MMC slot for some good 'ole BYOM(emory). This device will run approximately $250 to $300 plus another $100 or so for some memory for the beast. Edit: My bad. This device does include 512MB of internal memory according to the original review at Generation MP3. I think my French to English translator, Jean-Pierre, will be fired shortly.